This DSLR backpack delivers a compact, streamlined and urban-inspired solution for photographers who carry their gear through crowded airports and busy city streets. 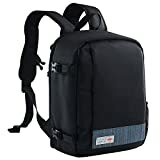 This durable backpack features several interior compartments to store and protect your equipment. For further convenience, dividers let you adjust and even remove the compartments according to your needs. The roomy and padded camera compartment provides protection for gear and the adjustable divider system makes for easy customization.Separate compartments give you quick access to your camera, lenses, lights & other gear. The Velcro dividers can simply be removed or relocated anywhere within the bag to fit the kit you require it to carry. Heavy-duty buckles and zippers are made for long lasting use in any condition. Waterproof nylon is wear-resistant and protects your camera equipment from the elements a soft while the padded interior cushions your gear from bumps and jostles. When full to the brim the backpack may be pretty heavy. The shoulder strap with padded waist belt evenly distributes weight and provides comfort whilst wearing. The adjustable sternum straps help you to keep the shoulder straps where you want them. This entry was posted in Discount Photography and tagged 16*H, 30cm, 36*W, Backpack, Camera, Canon, Case, Casual, Cover, DSLR, Gadget, NikonSize, Organizer, Outdoor, Photography, Portable, Profession, Rain, Sony, TOPMAX®, Travel, Waterproof by Ball Photo. Bookmark the permalink.